During the National Alliance for Grieving Children conference, Dr. Heidi Horsley interviewed Jordan Miraglia of Hands of Hope, an expert in helping children with grief. Miraglia is a bereavement coordinator and former student of Dr. Horsley’s. She works with the only palliative care organization in North Carolina. Partnering with a hospice organization, Miraglia works with grieving children in hospice and palliative care. She manages a bereavement camp twice per year, which is child-centered and family focused, helping the entire family unit. 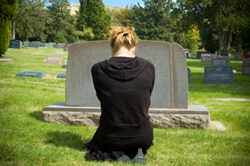 It is very tough to be the grieving parent of a grieving child. She recommends parents to help their kids get through a loss while also knowing you’re not alone. There are many resources that can help you get connected to peers. Use your networks. Secondly, know that parents and children are worried about one another. Opening that dialogue can welcome a lot of healing into your life. Get your children support and surround them with other kids who are grieving. This helps them realize that they’re not alone. Many parents don’t want to cry in front of their child—but children are feeling the same way. Communication is key, and so is finding your own support network. Almost nobody is truly alone in their grief, and absolutely nobody has to be. Your grief support network might not look like you think it should or will, but it’s available. You might have to tap it yourself. There are many organizations, and Hands of Hope is among them. There’s also the Open to Hope Foundation, Compassionate Friends, and a slew of other non-profits that offer hope and support to the bereaved. Find what works for you and your child, and get the help you need.